towards the end of June SCC issued ‘Pre-Action Protocol’ Letters to at least 14 named individuals, warning them that SCC would make a case for injunctions against them in the High Court on 12 July 2017, and giving until 11 July 2017 to sign and return a commitment to refrain from certain actions. Other people on Abbeydale Park Rise on 29 June 2017 were handed a standard pre-action letter addressed to ‘Persons Unknown’. Here is the Pre-Action Protocol Letter. It is the ‘Persons Unknown’ version. Recipients are seeking legal advice. Some of the residents on Abbeydale Park Rise who have not been active in the campaign before found this action extremely frightening and distressing. 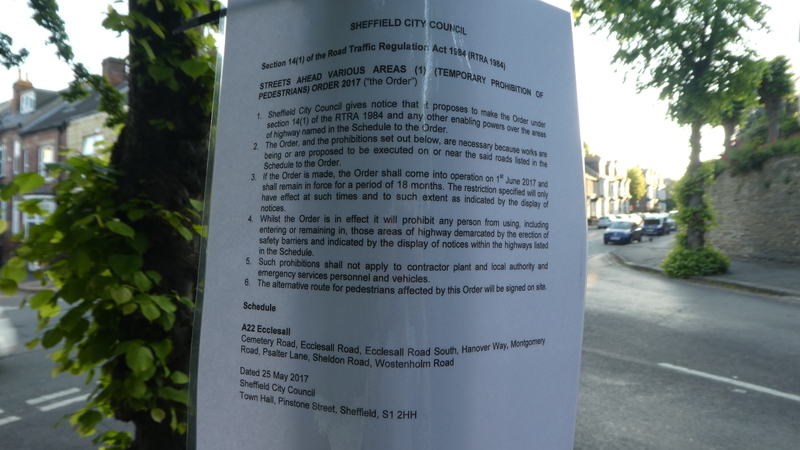 Over the past month Sheffield City Council and Amey have made a number of moves intended to prevent street protestors from opposing fellings. Similar notices are appearing on many of the streets listed and it is not clear whether these are the street notices referred to or if there will be any more specific notices indicating actual dates or locations. Note that the notices all say SCC “proposes” to introduce such orders, and use the expression, “If the order is made…” so we don’t know for certain when or if that will actually happen. During week commencing 22 May, when Amey mounted a very aggressive felling campaign, notices appeared on work area barriers and protestors were handed a letter from Amey and SCC giving a rather vaguely worded warning about illegal behaviour. The notices refer to both the Highways Act 1980 and the Health and Safety at Work Act 1974 but it is not clear how these might apply as they both deal mostly with the responsibilities of contractors and authorities rather than the public. Here is a copy of the Amey Warning to protestors 22 May 2017. This is the letter, the notice uses the same wording as the first part of the letter. Some time ago, SCC asked STAG to pass on a notice to its supporters. This made a reference to a ‘clear distinction’ between peaceful protest and lawbreaking. The STAG steering group decided that it should not circulate the notice as that would be doing SCC’s work for it. The steering group also felt the notice was extremely vague, especially about that ‘clear distinction’ which was not obvious to us, so we wrote to SCC’s Chief Executive to ask for more information. Last week SCC sent us a reply in the form of a 7 page letter, most of which appeared to be a Barrister’s opinion with very complex arguments as to why the protests against street tree fellings may be illegal. We assume this is connected to the notices prohibiting pedestrians from work zones and the two together are the foundation of a plan by SCC and Amey to enable fellings to continue without obstruction. STAG has consulted with lawyers and is seeking a barrister’s opinion on the various notices and legal opinion above. We believe that some of the assertions and assumptions in the SCC letter are not correct but without an expert legal opinion we are unable to say whether SCC and Amey could successfully enforce their fellings using civil or criminal actions against protestors. Unfortunately we cannot whistle up this kind of legal advice in a day, and lawyers do not have magic wands to make threats go away, but we will pursue this energetically and hope to have some practical answers within days rather than weeks. Action that you can take to support the campaign and keep the legal pressure on Amey. Any resident of Sheffield can do this to bring home the message to Amey and force them to take proper responsibility for getting permission, it doesn’t matter whether you live near a threatened tree. You can do it as a property owner or tenant, both have the same rights. If you believe that Amey should not have the right to work on or over private property without permission, please download this letter, add your name and address, and send it to Amey at the address provided. It’s making a clear statement that you do not give permission for Amey to enter or ‘oversail’ your home and garden to carry out their work. This makes it certain that they must gain permission to do so and cannot take your permission for granted, as they have been doing so far. It was a warning that we believed the police’s actions in giving warnings and arrests to be unlawful. People had been arrested when carrying out peaceful protest on the public highway and on private property with householder’s permission. A householder had been threatened with arrest if she remained on her own property within the danger zone of a street tree felling. SYP responded via Insp Stubbs on Monday to say that as we had not presented any legal arguments they would continue to act on their solicitor’s advice regarding the implementation of Section 241 of the Trades Union Act. On Monday 13 February 2017 at St Ronan’s Rd, Sheffield, Chris Rust presented this legal advice, by a barrister, Paul Powlesland, to Insp Stubbs of SYP. This addressed questions arising from arrests and warnings at Marden Rd and Chippinghouse Rd under Section 241 of the Trade Union and Labour Relations (Consolidation) Act 1992. Powlesland’s advice includes a discussion of what constitutes an arrestable offence under this act, considering arrests and warnings on both private property and the public highway. SYP withdrew from enforcing section 241 on St Ronan’s Rd and at another felling site across the city on Chiltern Rd to allow time for their solicitor to review the advice. Also on Monday 13 February 2017 at St Ronan’s Rd, Sheffield, Chris Rust presented this warning concerning trespass and ‘oversailing’, to Insp Stubbs of SYP. He suggested to Insp Stubbs that he share this warning with the tree work supervisor from Amey. This warning, drawn up by campaign supporter Julia Bodle, drew attention to the law relating to trespass and the need for an ‘oversail licence’ to be obtained by any contractor intending to carry out work in the airspace above a property. It has a direct bearing on the right to protest on private property and whether Amey (the main contractor in the Sheffield Streets Ahead Highways project) has acted lawfully in its felling work. SYP took this warning to their solicitor, along with the legal advice by Paul Powlesland, above.